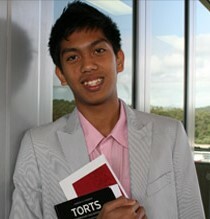 A New Zealand-born teenager has gone on to be the youngest law graduate in the Southern Hemisphere at the age of 18. Jozef Erece, 18, graduated from the University of Southern Queensland on Friday with a Bachelor of Laws. New Zealand born and raised, Erece graduated as dux of St. Peter’s Catholic School in Cambridge at the age of 11. He was offered a place at both Stanford University and Oxford University in courses for gifted children at the age of 10, but instead opted for a law degree. Graduating at an age when many of his law school peers would have started their degrees, Erece has been hailed by the Australian Scholarships Group as the “youngest lawyer to graduate at 18 years in the Southern Hemisphere”. He will be able to practice law in Australia after he completes his Graduate Certificate in Legal Practice at the Queensland University of Technology and gains admission. From there, he is considering opportunities at the Bar and postgraduate study. by Duncan McKee 22/04/2015 12:37:13 p.m. When did he fit in the youthful burst of fighting drinking and copulation like the rest of us? by M Young 28/04/2015 3:44:13 a.m.
Actually at the Catholic Boys high school he attended in Hamilton he couldn't have been more 'normal.' Trust me he's a good boy.